On April 16, Metro sent out a notice to Westside stakeholders of the 405 “Sepulveda Pass Improvements Project” that a bike path from Waterford Street to Constitution Avenue on the Southbound side of the 405 would be closed from April 18 until May 2 from 7:30 am to 3:30 pm. Cyclists groaned. When a similar proposal occurred in September of last year, cyclists were treated to a three month odyssey of shifting explanations as the community demanded Metro provide a safer route during the path closure. Cyclists are double worried this time because an estimated re-opening date for anything having to do with the Sepulveda Pass (Still Totally Worth It!) Project is always a moving target. 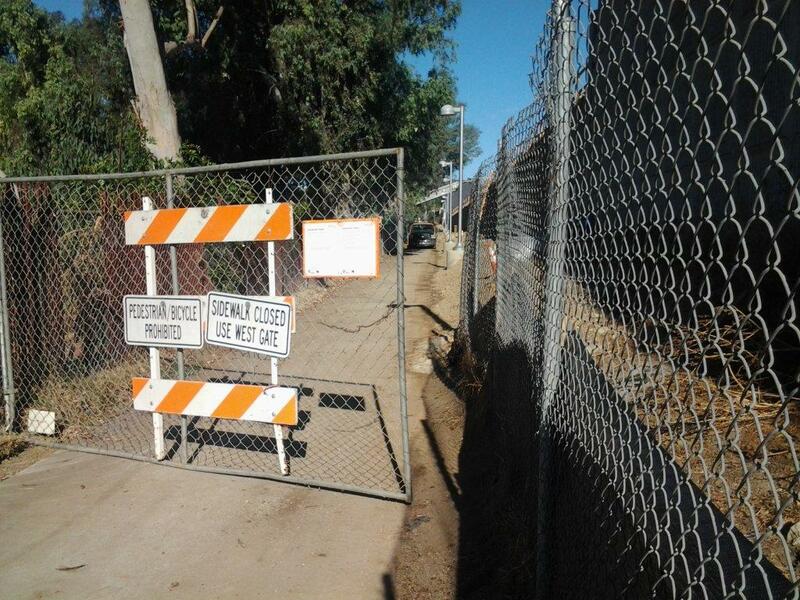 On May 9, mathematical sciences professor Allon Percus approached the path, and saw that it was still closed. He fired off a letter to Metro staff, and was immediately rewarded with a full closure of the bike path for twenty four hours a day, until May 16 at the earliest. Yesterday, Metro re-noticed the community, retroactively, that the bike path would remain closed from May 2 until May 16. For their part, Metro staff assures Percus that the closure is a safety concern, and that the extended hours of the closure are also for safety reasons. Taking them at their word, that the path is now dangerous even when construction is not occuring, their safety solution (available to read in the closure notice) for cyclists and pedestrians is, in a word, unsafe. Furthermore, I am not sure if you realize this, but the recommended bike detour requires northbound cyclists to run a red signal in order to cross Sepulveda Blvd. at Constitution Ave. That is because there is no means provided for bicycles to trip the automotive sensor that activates the green signal for cross traffic. The pedestrian buttons have similarly been deactivated at this intersection. At this late date, the best we can hope for is that the path re-opens “on time” this Friday for the weekend. Hopefully Metro learns a lesson that notifying cyclists when closing their routes is just as important as notifying drivers when it has to close a street. I’ll be out of town starting Friday morning, but if anyone wants to check it out on our behalf, please send a picture to damien@streetsblog.org. This crap would not be tolerated for motorists, why is it acceptable for project managers and road engnieers to impose it on pedestrians and cyclists. Oh yeah, I forgot. Silly peasant me. Is this bike path still closed? I am new to LA, and have been searching for my bike route to UCLA campus, as classes begin in a week and a half. I didn’t notice the path when I was biking earlier this week, and took Sepulveda (an experience I really do not want to repeat!). I’m worried I didn’t notice it because it was blocked off. Thanks! Orange Line Bridge To Speed Up BRT Buses, But What’s Underneath? Metro's planning to elevate a mile of the Orange Line busway. What should Metro prioritize in the newly-opened spaces below? Metro expects to see the preliminary (30 percent) design completed shortly and to hire a design/build construction contractor to finish the plans and break ground by mid-2018. The project would be completed in late 2019, around the time that the Crenshaw/LAX Line would be opening. Last Thursday, Metro and Cityworks Design held two meetings to lay out the design options for Segment A of the Rail-to-River project for the community and to solicit feedback. Metro is moving forward with adding gates and bridges to the Orange Line BRT. Groundbreaking is expected next year.